Montana is a great location to start your small business. Aspiring entrepreneurs have access to a variety of industries including manufacturing, retail trade, arts, and more. In 2018, 99.3% of businesses were classified as small business, employing 65.2% of the Montana workforce. 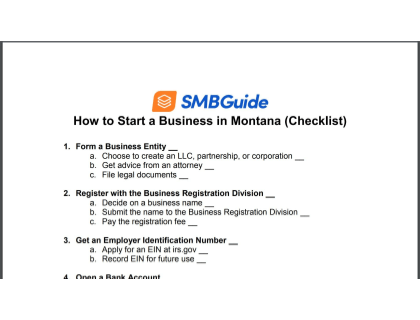 Use this detailed checklist to stay on track when you start a Montana business. Sole Proprietorship: the simplest business structure. Owned and managed by one individual, with no legal difference between the owner and the business entity. 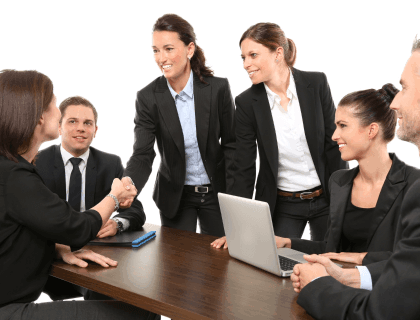 Limited Liability Company (LLC): one of the most popular legal business structures. It separates the owner/s and the company from a financial and legal perspective. Corporation: Known as a formal business structure. By law, the business is recognized as a single entity. Includes unlimited shareholders. Partnership: Operated by two or more individuals who share management responsibilities and profits. General and limited partnerships are the most common. Your business structure should offer you good liability protection and financial benefits, for you and your business. For small business owners, an LLC business structure is a great option. It's simple to set up and manage, with minimal paperwork. In addition, this structure is beneficial during tax season, as LLC owners are not required to file a corporate tax return. You can set up an LLC in the state of Montana for $70.00. Montana law requires all business owners to register their business name with the Montana Secretary of State (SOS). Before you are able to register, you must first verify if your business name is available. You can check which names are already on file by doing a business entity search on the SOS website. LLCs and corporations can reserve a business name for 120 days by filing a Reservation of Name Application. If you're starting a sole proprietorship or partnership with a business name that is different from the names of the business owner or individual partners, you must file an Application for Registration of Assumed Business Name with the Montana SOS. 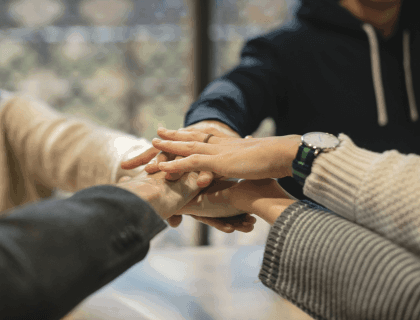 You must obtain a federal Employer Identification Number (EIN) if you plan on hiring employees, or if your business is taxed separately from yourself. Issued by the IRS, your EIN number helps determine taxpayers who are required to file different business tax returns. A separate business bank account will ensure your finances remain organized. 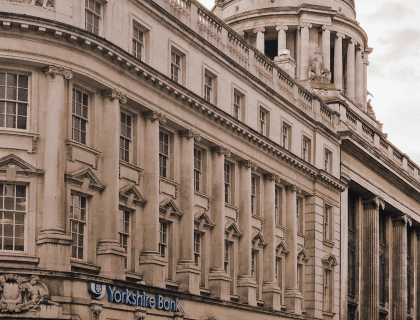 Visit your local banks and research the different business bank accounts available. 5. Register with the Montana Department of Treasury. Montana is one of four states that does not have a required sales, use, or transaction tax. If you need to send a resale certificate to any out of state vendor/s, you can use the Montana Business Registry Resale Certificate. However, if you plan on hiring employees, you need to register for an employer withholding tax number with the Montana Department of Revenue (DOR). You can register for withholding tax online using the Taxpayer Access Point (TAP) or on paper, using Form GenReg, Application for Permit. The Directory of New Hires law requires Montana employers to report all newly hired or rehired employees within 20 days of employment. This process must be repeated every time you hire a new employee. Rehired employees who have been separated from the business for 60 consecutive days are also classified as new hires. You can report new employees online here. In order to file online, you first need to create an ePass account. The ePass account is free and will allow you to access other state electronic services. You can also report new employees by fax, mail, or via telephone. For more information, read through the Employer New Hire Reporting Guide. In Montana, not all businesses require a general business license. However, depending on your business, you may still need a state license, permit, or registration. Many professional and occupational services also require specific licenses and permits. For example, if you plan on opening a restaurant, you will need a food service license from the Department of Health. For more information, you can search through the different state-issued business licenses by going to the license section of the Montana government website. Under Montana law, all business owners who employ one or more employees must provide workers' compensation insurance. This may also apply to independent contractors, except if they provide proof of self-insurance or file an exemption form. All employee drivers are required to carry minimum automobile insurance. If you plan on using your car or truck for business activities, a commercial vehicle policy is recommended. For information about Montana exemptions and compliance, contact the Montana Department of Labor. Once you launch your business, you need to stay up-to-date with the different laws or regulations that may affect your business and industry. In Montana, LLC business owners must file an annual report with the Secretary of State by April 15th. There is a $35.00 filing fee. To ensure the fastest confirmation time, Montana SOS encourages all businesses to file their reports online. The online filing option means your report will be processed immediately, and confirmation is sent as soon as payment is confirmed. Alternatively, you can also download a pre-filled form to send by mail. A corporation in Montana must also file an annual report with the SOS. Filing online is the fastest and easiest method to file a report. A report can also be sent by mail. There is a $35.00 filing fee. How much does it cost to register a business name in Montana? It costs between $20.00 - $70.00 to register a business with the Montana Secretary of State. In addition, there is a $50.00 fee for each series member named in the series LLC. Where can I apply for a Montana sales tax license? There is no sales tax in the state of Montana. Are there any specific rules for an LLC in Montana? In order to register your LLC, you must file the Articles of Organization with the State of Montana. You can file online, by mail, or in-person. The filing costs $70.00. In Montana, an operating agreement is not mandatory. Yes. Montana law requires all employers of one or more employees to carry workers' compensation. How do I register a business name in Montana? You can register your business name with the Montana Secretary of State. You can visit the SOS website for the proper documentation.